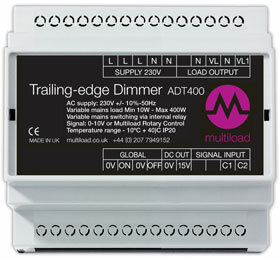 0-10V controlled trailing-edge dimmer housed in a DIN-rail enclosure. 10W to 400W. Provides exceptionally smooth dimming of LEDs and other light sources dimmable by trailing-edge phase control. Global on/off provided for PIRs, master switches etc. 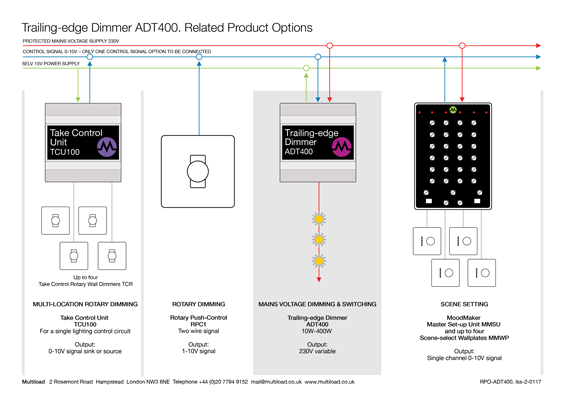 In a retrofit situation when, for example, a switching installation is to be replaced by a RPC Dimmer and ADT400, it is possible to use existing wiring. Enables 0-10V rotary dimming and switching. RPC Push-control Dimmer fits or clips into wall plates and grid systems from UK wall-plate manufacturers. Allows up to four Take Control Rotaries to be positioned around a room or building, with each seamlessly taking control of switching and dimming.